73rd time for Weekend Cat Blogging, this time hosted by Kayak Soup! As Halloween is coming up, I'm showing Edith this week - she's the closest we have to a black cat. (She's a black smoke British Shorthair.) Incidentally, she also has a birthday coming up, on Thursday! This picture was snapped yesterday, during a quick walk which wasn't very enjyoyed, I'm afraid. Too cold, and too many strange sounds. Edith was happier when she snuggled up in my arms, and we went back inside. Head over to the round-up for many more cute kitties. Poor chilly kitty! Here in Miami, we had a "cold front" finally move in for the first non-humid, cooler days since March. The doors and windows are open so all of the indoor kitties can enjoy the fresh breezes. It's up to a whopping 82F/28C today, yes, that's our cold front! In honor of the cold, lol, I'm baking lamb shanks, the first comfort food of the season. Next, sauerkraut and pork. Lulu the kitty had some lamb scraps from when I removed the "silver skin" and she is excitedly awaiting the meal. 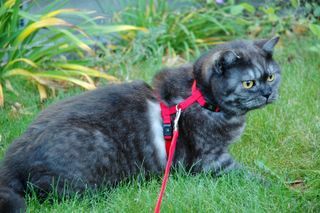 Edith is a beautiful British Shorthair, which are among the nicest of all cats. Thank you for posting. Happy Halloween. Does Edith have a white undercoat? Anya, my cats would just love to move to where you are :) And hey, lamb shanks? I can't even find that cut here, but it sounds SO good. Only a cat can look so dignified in a halter. I'm impressed that you managed to put it on her. My cat is the Houdini of halters. Impossible to keep her in one.